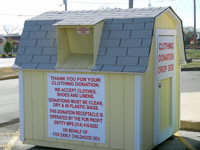 We have over 450 participating Drop Box charities in the St Louis Metro area. They range from The American Red Cross to Zahnow Elementary. For more information regarding these charities contact us at 636-282-0000.